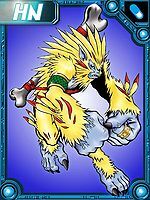 A legendary Beast Man Digimon covered in golden-colored body fur. Although there have been many sightings of it reported in the Central Asian area of the Network, evidence proving its existence has not been found as of yet. It is extremely rare, and is said to be treated as a phantom Digimon by a group of people due to its exceptional skill in repelling malicious computer viruses and similar entities. There have also been rumors of it circling the Network at high speed while riding atop something resembling a cloud or puff of smoke. 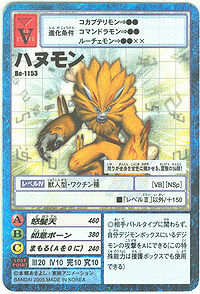 Its Special Move is further hardening its metallic body fur and shooting them out (Dohatsuten). Adult. 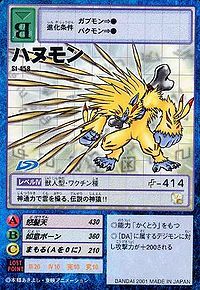 Possessing golden fur, it is a legendary Beast Man Digimon. Its Special Move is Dohatsuten. — Digimon Adventure 02: "Today Miyako is in Kyoto"
From Hanuman (हनुमान्), a Hindu deity depicted as leading an army of monkeys to fight the demon King Ravana in Hinduism. 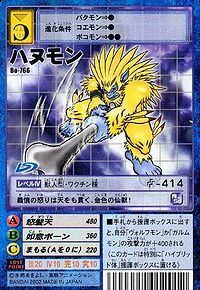 Anime/Manga Digimon Adventure V-Tamer 01: "Mighty Wing"
Dohatsuten  Infuriation 怒髪天 N/A Metallic Fur/Angry Strike Hardens its fur to metallic hardness and shoots needle-like hairs from its body. Nyoi Bone [N 1] Rúyì Bone 如意ボーン Nyoi Bōn Mega Bone Stick/Bone Stick Attacks with its extensible bone club. 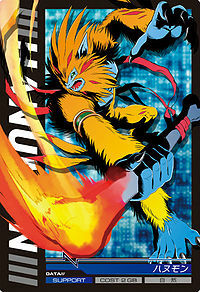 Maen Moubakuken  Demonic Monkey Intense-bombarding Fist 魔猿猛爆拳 N/A Magical Monkey Punch A series of flaming punches. Hanumon was among with non-X-Antibody Digimon whose appears at the meeting of War Greymon X-Antibody, when the conversation end, it got killed by Omegamon. 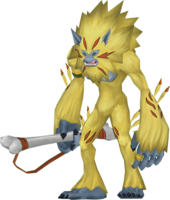 The different Hanumon is a member of Silphymon's group. A Hanumon is pictured as one of the Digimon killed by Kurata Akihiro's forces. 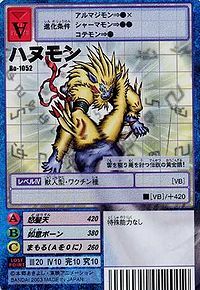 Hanumon is an obtainable Digimon. Evolves from Bakumon (8+ DP) and can evolve to Mammon (0+ DP). Appears as a random enemy in Phoenix Bay on Asuka Server. Can be evolved from Gizamon if above level 22, or can be found at Old Canyon. He can evolve to Hangyomon if above level 37. He also gives you a Onegai Quest to obtain a Chrome Digizoid Metal at Chrome Mine, in order to make a Akinakesu for Dinohumon at Cliff Valley. 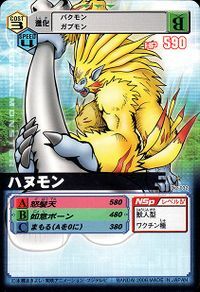 Can be evolved from Shamamon if above level 26, Holy 750, and already befriended Hanumon, or can be found at Limit Valley. Can evolve to Kyuukimon if above level 34, speed 180, and Beast EXP 4000. 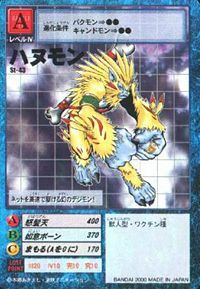 Hanumon is a minor enemy Digimon. It can only be obtained as a collectible DigiCard. Hanumon is available as a Digimon Medal. Evolves from Bakumon or Candmon. 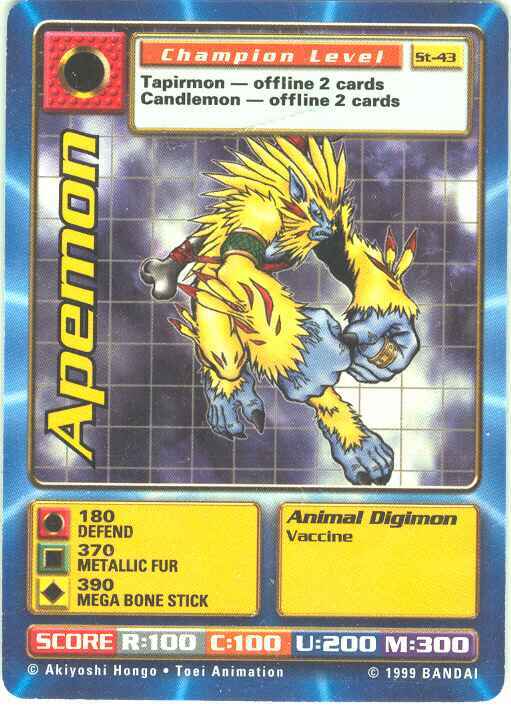 Can evolve to Mammon or be Jogressed with a compatible Digimon to get Were Garurumon or Pumpmon. 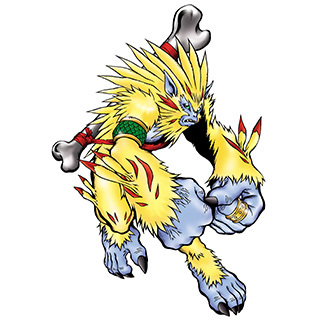 Hanumon is an enemy Digimon in Area 02 and 03. A phantom Digimon who races through the Net! This legendary, divine monkey uses its divine abilities to control the clouds! This golden hermit beast's anger towards injustice pierces even the heavens! This legendary golden monkey rides atop clouds and strikes evil down! The wrath of this hermit monkey of miracles causes its whole body to shine a golden color! A phantom Digimon said to have been sighted around the Central Asia region. Golden fur covers its body, and it rides upon what is apparently a cloud, which allows it to freely traverse the network and exterminate viruses. ↑ Ruyi is a decorative object associated with Chinese Buddhist ceremonies that was made from bone, jade or other valuable materials, with a cloud-shaped head and a slightly curved handle.